Aside from being freakishly tall, Joe is just an ordinary divorcee taking his son, Danny, to the zoo for his weekend of custody. Everything is going great until a bizarre snake attack sends everybody in the zoo running for cover. It isn't long before Joe realizes that there is a lot more going on than a simple snake attack. And if the hungry lions, roaring gorillas and charging elephants now free from their cages have anything to say about it, there is more bloodshed to come. All of the world’s animals are attacking, and no one knows why. What they do know is that man is now on the bottom of the food chain. It's Animals Gone Wild!! Recently I reread Animal Kingdom (originally read January 2012) and decided to go back to the original Amazon review that I wrote to see if I still felt the same way nearly a year later. Well let me tell you, this book was great the first time around but was even more enjoyable on its reread. I found it nice not having to focus so hard on the main characters which gave me the ability to focus more on the animals themselves and secondary characters as well. Ever watch those Shows When Animals Attack? Well this book gives you a pretty realistic clue about what happens. The main Character Joe is visiting the Zoo with his son Danny. Within the first few pages you realize something is very wrong. Animals are missing from exhibits and then a Boa Constrictor turns on its handler and kills him. What could of easily been an accident tuns out to be much,much worse and soon its death,destruction,carnage and fur a flying letting the reader know this is quite different then your run of the mill Apocalypse style novel. As with most books in this style eventually the survivors meet up and and try to reason what just happened. Sadly for the survivors the animals just wont give up the assault. Bad for them but good for us as readers! One thing I noticed that I didn't before was the phenomenal build of the Animal Apocalypse. The pacing was brilliant because it really makes the reader second guess if it was only the Zoo or was this widespread, possibly global?? What makes this book so scary is that this doesn't just affect a specific group of animals. Every creature from Gorillas to the smallest insect seemed to be affected and that is truly frightening. 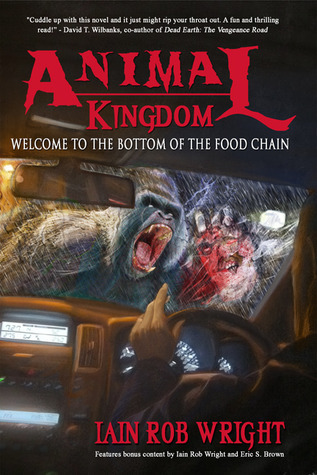 In a way Animal Kingdoms Apocalypse is way scarier than that of say a zombie apocalypse. With Zombies your death is pretty straightforward and you could potentially outrun Zombies and hole up somewhere undetected. Now throw in an unpopulated area and your chances of survival increase even further. Animals on the other hand are pretty much everywhere. If a land based predator didn't get you then you always have birds and don't even get me started on death by spider swarm. Speaking of spiders, fun fact: Did you know you are never more than 5 feet from a Spider? Think about that and then read this book, I dare you. Overall Animal Kingdom was and still is a great read. My only little gripes were the book was left open ended and you never find out a why in the main story as to the animals behavior which does kinda irk me. I still haven't read all the short stories that take place in this world but the few that I have did provide some clues and in all honesty should of been added to the book proper rather than included as an afterthought. I'm bumping Animal Kingdoms rating up to ★★★★.5 stars. If you're in the mood for some seriously sick and twisted awesomeness than I highly suggest picking Animal Kingdom up and giving it a try. 4 stars!! would love to read.